Do you ever wonder what happened to your sweet child? Holy Moses, the back talk! Why do they argue so much and refuse to cooperate? They’re still lovable, funny, and charming at times – it’s not like they’re bad kids. So what’s up with getting in trouble at school, nonstop bickering with siblings, and the disrespectful come backs when we ask them to straighten their room or clear the table after dinner? Challenging behavior is difficult to manage as kids get older and more independent. Headaches abound as you’re constantly forced to deal with an obstinate or sassy child. So what is there to do? Ask the Discipline Chic, that’s what! After helping thousands of caregivers with toddler discipline, author Michelle Smith is back again, telling it like it is with discipline for five to twelve year olds. Bold and witty, Tiger Tamer teaches you how to maintain calm authority, manage verbal come backs, and teach kids how to behave appropriately. Whether you are an educator, parent, grandparent, aunt, uncle – it doesn’t matter. Tiger Tamer is the answer to your discipline needs. 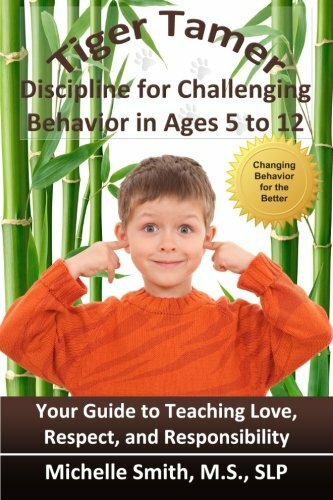 Get the inside, professional secrets on how to deal with: · Constant negative exchanges · Backtalk · Defiant or demanding behavior · Sibling arguments · Refusing to listen to adults · Bossy, whiny, or stubborn personalities · And much, much more! Michelle received her undergraduate degree in Speech-Language Pathology and Audiology in 1993 and a masters degree in Communication Disorders in 1995 from the University of Texas at Dallas. She completed her internship at Medical City Dallas Hospital and earned her Certificate of Clinical Competence (CCC) in 1996 from the American Speech-Language-Hearing Association (ASHA). Her most memorable case of therapy involved "Kay" - a two year old found at the bottom of a swimming pool. Seeing the dedication of Kay's mother to the recovery of her severely brain damaged child, Michelle developed an early and profound respect for all Mothers. In 2000, Michelle took a break from working to start her own family, having three girls in five years. Immersed in all things "Mommy", Michelle decided to write a book dedicated to people just like her: confused, amazed, exhausted, guilt-ridden, and baffled on what-to-do-next. Journey with her as she writes with empathy ("..while I write this very sentence, my child is trying to tear her crib apart in a raging, screaming, fit..."), dedication to getting tough ("Throw that guilt monster out the window, girlfriend!") and a professional eye for what really works in toddler discipline. Teaming up with Dr. Rita Chandler, a Nationally Certified expert in behavior, Michelle decodes the technical aspect of steps to improving problem behavior, but stays devoted to teaching discipline techniques with the emotions of caregivers in mind.